"Thank you" are two simple words that hold so many meanings for us today. We heard this phrase over and over as we led people to Christ and prayed with people in need of jobs and family situations. Thank you was said from the volunteers as we closed up the "glasses campaign" for the week. And our hearts burst with thanks back to them for allowing us the opportunity to participate. We say thank you to God for calling us to come and for using us! What a week it has been with over 1,000 people exposed to the Gospel - a seed planted, watered, harvested or grown - all happening from these last five days. We also were able to say "Thank you" for the two meals provided to us by the church members today. What fun we had sitting with the people we have worked alongside all week deepening relationships and encouraging one another. Thank you also to those of you in America who gave the almost 2,000 pairs of glasses we brought over! Thank you also for praying and helping make this trip so effective! One thing that has been evident as we share the Gospel is that so many people say they do not know if they are going to heaven but once we have led them through the verses, they realize they have actually made this decision and DO know for sure. Some may just be saying yes to say yes but others it appears have made the decision in the past but have not been trained or taught. "Thank you" Hope Baptist Church for being a light to the community of Sunnyside in the way of training/discipleship of the believers in what and why we believe what we believe. 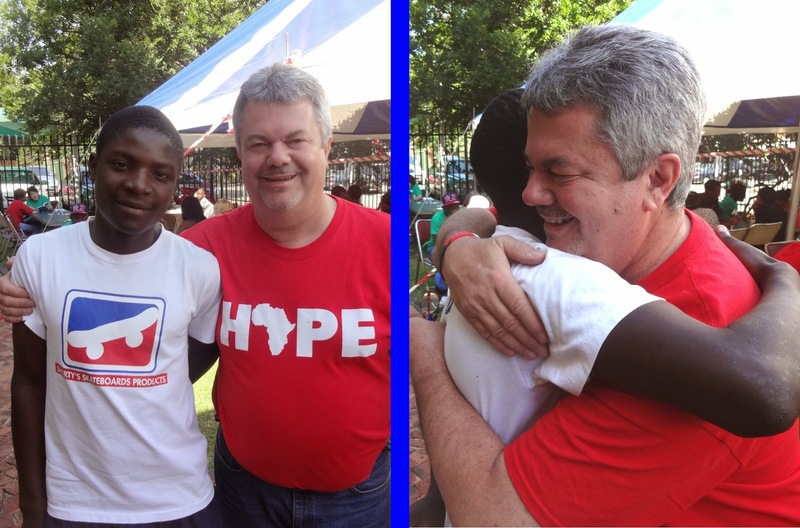 If you have noticed while you have read the past blogs we are a team, and many of the volunteers have HOPE shirts with the "O" being the continent of Africa. These have been quite the conversation starters. As Mel Anderson says, when people ask about them it's easy to share the Gospel. Mitch McDonald experienced a different kind of ministry today as he had to take a trip to the dentist for a cracked tooth. God put him there to share with literally all of the office staff and everyone in the waiting room. Who knows why God orchestrates this type of "bad luck" during a trip like this, but even so, we can say "Thank you" for the plan at work that we do not see. There are a lot of smiles in Africa! Robin happily shows off her new Bible and her new birthday! young lady that you can imagine and Mona gave her one of the "Fisherman's Bible" New Testaments that we have been using to share the Gospel. Mona suggested she write her name and her "born again" birthday (today!) on the front page of the Bible so she will always remember. Robin said she will be at Hope Baptist on Sunday, so pray with us that she follows through on that so she can continue to be surrounded by believers as she is such a new Christian. And that, our friends, is just ONE story from today that occurred even before we opened the front gate to the church! Once the gate was opened, people continued to stream through that gate and were at times lined up 10 or 12 deep as they came for the free glasses and the chance to find out what excitement was happening at the church at the end of the street! to speak to a volunteer was often quite long. A lady named Judith sat with Katie. She said she prayed a lot and that is how she would get to heaven. After being led through verses on salvation she realized she had never made that decision. She prayed and then Katie prayed. She opened her eyes in amazement and said, "When you pray for me I see light." She had not experienced this before. Katie encouraged her that that was God telling her she had made the right decision. Speaking of decisions, there were SEVERAL other decisions for Christ made today as God continues to bless this little church in a mighty way! We've also had many people either looking for or not having a church. Maybe they have found their family coming to Hope Baptist! Pastor Julius is expecting a BIG Sunday. We figured the church building could possible hold about 400-500 but it seems like a good motto for Africa would be "There's always room for one more!" We wait in anticipation to see how many God brings. 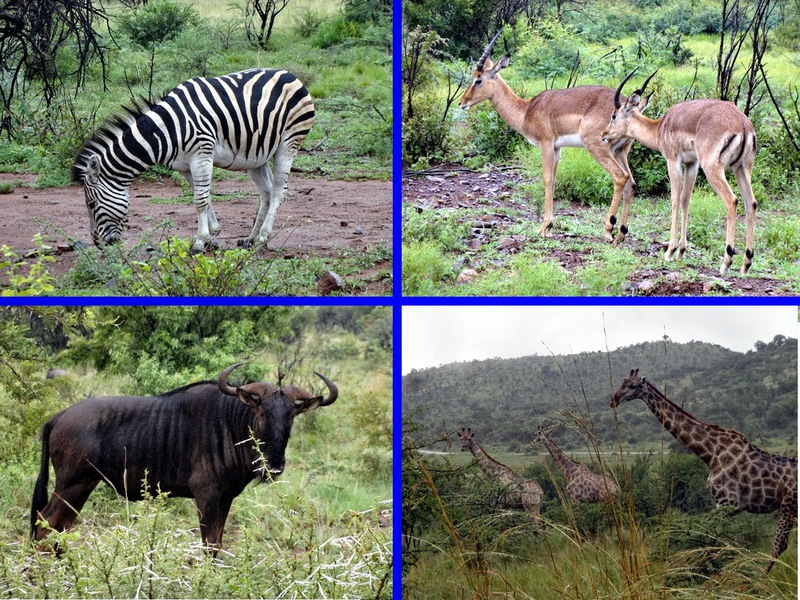 Another possible exciting contact made today was Mitch & Mona McDonald, Keith Matney and Pastor Julius, who met with a reach out organization in Pretoria that has a medical facility. They are interested in maybe beginning a pregnancy center outreach to Pretoria much like what Arizona Baptist Children Services runs in the Arizona pregnancy centers. Of course Mona is the best contact for them! So tomorrow will be our final day of distributing glasses and evengelizing in that way, and we so look forward to Sunday morning -- but let's not get ahead of ourselves and see what the Lord has in store for Friday and Saturday! present, just a few steps from the church's front entrance. clothing, while her daugther Andrea squeezes in. FWEN-kay), an HBC member and volunteer speaks to one of the visitors. Another day down. It's been a good day, profitable in sharing the Gospel. We have had a number of salvation decisions, even as the rain came down for a bit this morning and squeezed us ever closer under the blue and white tent -- but people came anyway. 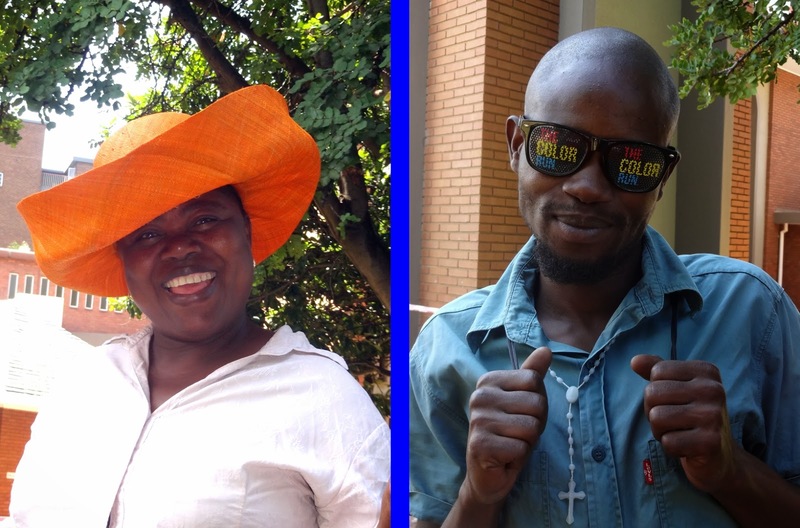 When we tell the people that the glasses are free or "mahala," some cannot believe it -- nothing is free. But yes! We are privileged to also tell them of the ultimate gift of eternal life that is truly free! 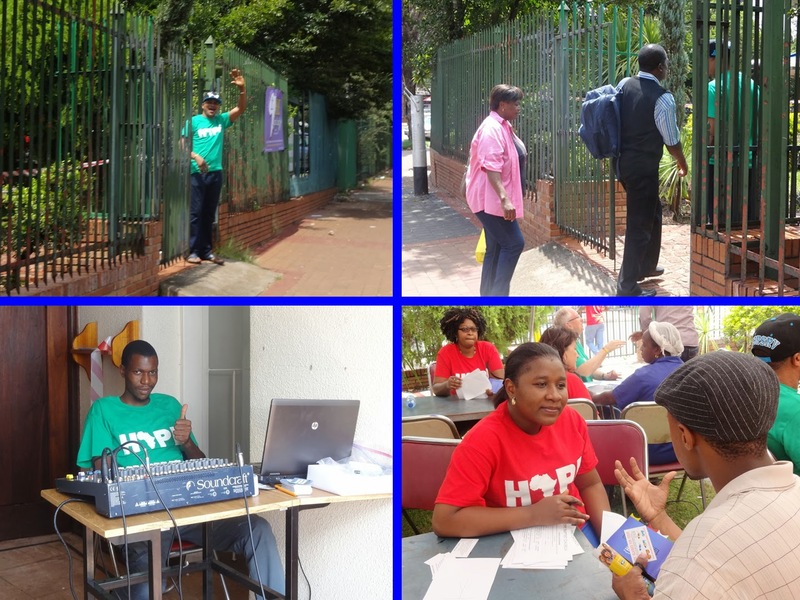 After a morning of distributing many more glasses, we changed it up in the afternoon as we participated in a "clean up campaign" walking down the main street of Sunnyside in our green or red t-shirts that say HOPE and picked up trash in the midst of all the bustle of the city. Pastor Julius was very excited for us to do this as he says it is very rare for anyone in Pretoria to volunteer to clean up for no pay. We got many side-ways glances and questions as to what we were doing, but we were proud to be able to point them to the church at the end of the street. Kevin had spoken with one gentleman earlier in the day and when this man saw us picking up trash in the afternoon, he yelled in a lighhearted tone to Kevin, "American man! What are you doing??" The Hope Baptist Church volunteers that have joined us everyday are becoming so dear to our hearts. We would love to pack many in our suitcases when we come home. We have shared in laughter and tears. Much of the laughter comes from a young man named Rigobert, who grew up in the African country of Cameroon, but now lives in Pretoria. He has a great smile, very friendly and a man on fire for the Gospel -- not ashamed! 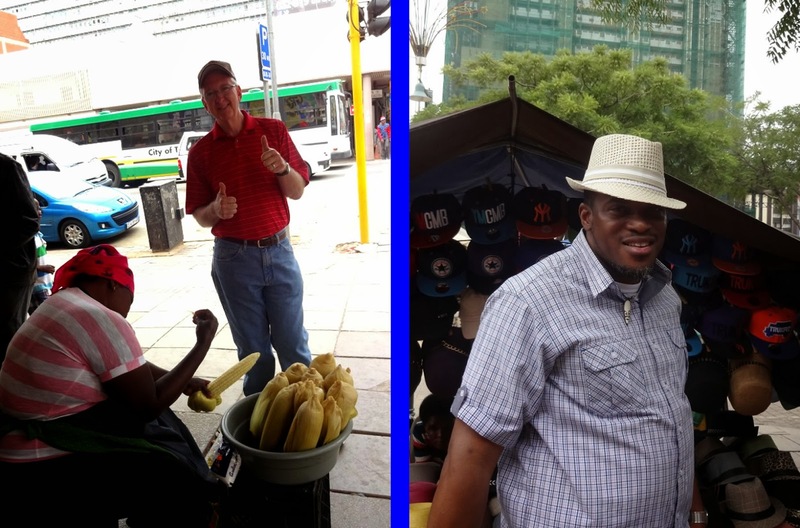 Pastor Julius has told him that he is the "first on his list" for his 5 church planters he is seeking in 2014. Tears of prayer came to us in the news yesterday afternoon about Musa, a son of a very dedicated couple from HBC, Paballo & Pinkie. He ate something at school which caused him to vomit immediately and pass out into a coma. The doctors at the hospital were not giving the parents a favorable report. Pastor Julius was afraid the boy would be fatal. Throughout the afternoon and evening we prayed as our group went out. What a miracle to hear today that the boy had regained consciousness and had even, beyond our belief, been sent home with his Grandma! Our new friend Busi (Katie's friend from Zimbabwe) has been an inspiration to all of us as we begin to fall in love with this gracious and humble spirit. She has no hesitation in sharing the Gospel along side us, breaking out in prayer (and song!) and is constantly giving God the credit for the miracles He does in our lives. This evening she gave a short singing concert to some on the team in two of the languages of Zimbabwe. The last song she shared told of the truth that man's love is measured, but God's love is endless. We look forward to seeing more examples of His endless love as we continue to serve tomorrow. 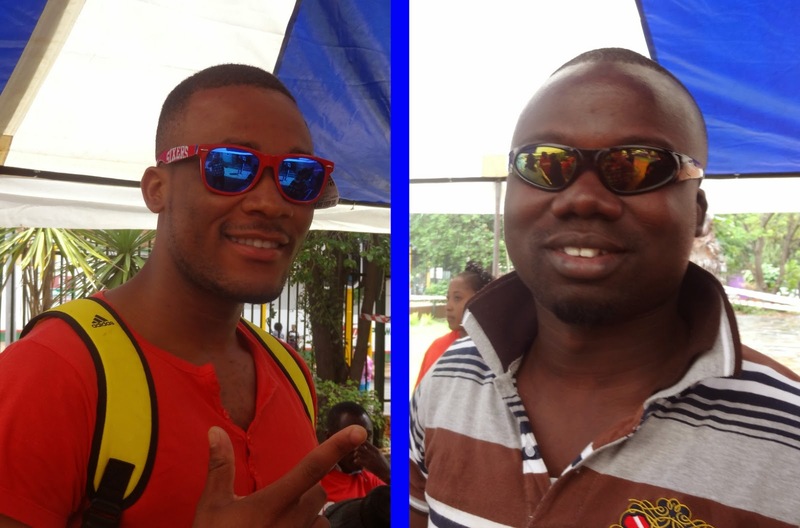 Two more visitors are happy to recieve new sunglasses! 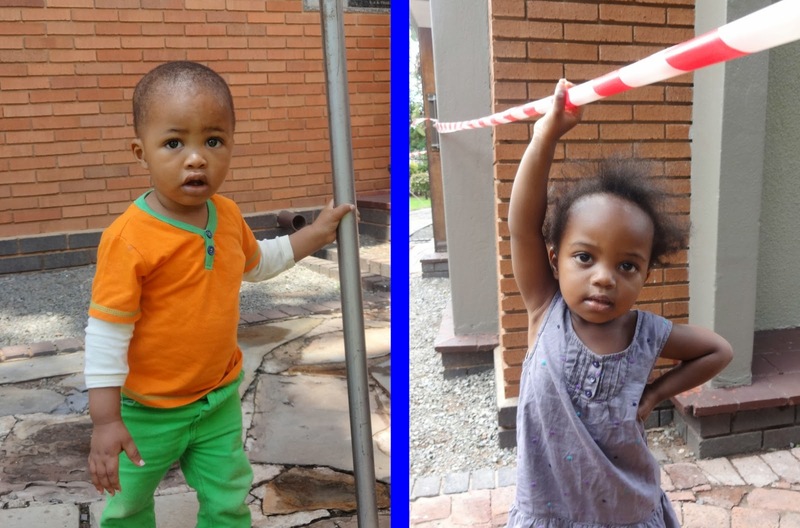 "Keep Pretoria Clean and Green"
members of Hope Baptist -- you can say "Awwwww..."